Approach key human rights issues with aim of gaining deeper understanding of the meaning and practices of topics in human rights. Examine historical and theoretical foundations of human rights, institutions that make up the international and regional human rights systems, analyze complexities, including legal, social, economic, historical, and political, surrounding specific questions in human rights. Students are introduced to relevant topical issues such as nation-state sovereignty, crimes against humanity, genocide and ethnic cleansing, torture, and enforcement mechanisms. Consider, also, "culture" as an indicator of human rights variance. Seminar systematically analyzes international law and mechanisms for reconciliation at transnational level. Consider occidental moral philosophies and secular human rights system, alongside local knowledge and non-Western value systems. Seminar examines the creation, production and proliferation of law and legal categories relating to the status of refugees and asylum-seekers in the U.S and abroad. Course integrates anthropological perspectives on law's ability to create meaning in the examination of the deeper implications of asylum and refugee law in American society and beyond. Case studies shed light on disparately impacted groups, such as women and children. Seminar focuses on women's political and legal status in Muslim-majority societies, with emphasis on lived experiences. Unpack stereotypes of women in Muslim societies. Readings focus on local settings and examine conditions, political, economic, social and historical, through which women perceive their roles, rights, and identities. Engage with feminist and post-colonial theories, and theories of the state. Explore debates on human rights and women's rights. Seminar focuses on disparate impact of war and state security apparatuses on lives of women and children. Explore distinct impact of the "global war on terror" (GWOT) on women and gender relations, with a specific emphasis on the impact of the GWOT on the lives of people living in the Middle East and North Africa region and of people of Middle Eastern descent living elsewhere. Seminar considers why we care about the suffering of others. Asks when do we decide to extend compassion to those living precarious lives? Explores ethical principles and institutions that guide these commitments. Takes anthropological and socio-legal approaches to understanding humanitarianism as an "ethic of kindness" that guides social, political, and moral debate around addressing the suffering of people far-away and bearing little resemblance to us. Readings examine which lives the international community sees as worthy of saving, and why. Begins with an examination of the political and anthropological theories underlying social concern with suffering. Considers historical foundations and legal instruments of international humanitarian action and explores contemporary acts of humanitarianism in different upheavals, crises, and conflict situations. Focus on politics remains throughout. Seminar considers social realities of gender and law in Muslim-majority states. Readings examine post-colonial state-building as process contributing to contemporary articulations of Islam and gender roles and to building a coherent past in dialogue with modernity. Main questions of the course include: What are some of the different ways post-colonial states in Muslim majority societies have taken shape? How are gender and law implicated in these processes? While we are interested in understanding the complexities of gender and law in Muslim-majority societies, in this seminar, we also question how such knowledge is produced. Taking an interdisciplinary approach, the course challenges positivist assumptions about categories such as gender, law, and family, while taking critical view of how scholars write, research, and approach these subjects as research topics in Muslim-majority societies. Seminar brings insights from socio-legal studies to the study of Islamic law and society. Uses post-structuralist theories to trace meanings of 'shari'a' referred to as 'Islamic law' and 'umma' or 'Muslim community' in Muslim contexts. Considers socio-legal issues in Muslim-majority states by exploring state structures and civil institutions, especially juridical, which include 'fiqh' or 'Islamic jurisprudence,' hybrid legal systems, and operations of Islamic laws. Primary aim is to unpack political, cultural and economic logics underlying regulatory systems to gain understanding of how Islamic principles (shari'a) are translated into law (qanun) through civil codes, how they operate legally and socially in Muslim-majority societies. Readings examine post-colonial state-building, integration of Islamic principles, family and personal status laws, and criminal sanctioning. Also considers jurisprudential debates among religious scholars, who offer guidance on new issues with which Muslim communities are faced, such as human rights, death penalty, and gender equality. Seminar casts critical eye on the production of knowledge on and about the Middle East and North Africa (MENA) region. Drawing from anthropological tools for critique, we will focus on discerning how colonial and western histories, writings, and policies have shaped our understandings of the MENA region. In doing so, we will be questioning the apparently static nature of various topics and categories that we take for granted, such as modernity, Islamic law and practice, religious revival, gender relations, and the role of women. In addition, we will shed light on new approaches to the study of the region, particularly with regard to nationalism, Muslim diasporic communities, and the politics of rights. Seminar explores key concepts in modernity, building on previous core courses, to make sense of how anthropologists employ social theories of modernity, both in their field research and data collection and in their ethnographic writings. Focus on the formation of the triad – state, property and self – defined and refined since the European Enlightenment, and through which our contemporary worldviews are shaped, including the academy, the disciplines, anthropology, and how we study 'others' and ourselves. In addition, encounter critiques of modernity as a structured social order, a 'meta-narrative,'' and a singular epistemology. Seminar examines relationship between law, culture and power in contemporary societies. Students grapple with modern liberal law through post-structuralist interventions, including feminist and critical race theories, which consider human subjectivity, agency and identity. Explore how law in society plays a constitutive and productive role, not just a repressive or coercive one. Consider relationship between liberal law and the body, possessive individualism and discourses of rights. 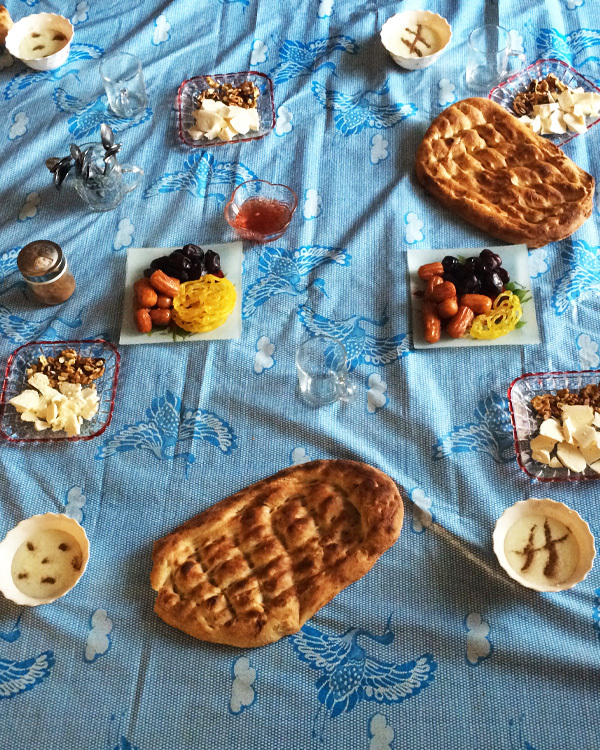 Breaking fast in Ardebil, Iran.